The Vickers Vellore was a large biplane designed as a freight and mail carrier. The first aircraft were a single engine versions but later variants were twin. A final variant was built as an airliner with a broader fuselage and named the Vellox. The Vickers Vellore, named after the Indian city of Vellore in the state of Tamil Nadu, was a response to Air Ministry specification 34/24, which called for a civil mail and freight carrier. It was a large single engined two bay biplane, metal framed and fabric covered. The wings were of equal span with a slight stagger and swept with simple parallel interplane struts. Both upper and lower planes carried balanced ailerons. The gap between the wings was large enough that there were gaps both above and below the fuselage which increased diameter rapidly behind the uncowled radial engine. The crew sat side by side in an open cockpit at the highest point of the fuselage just in front of the wings giving an excellent view. Behind them was the cargo hold with the fuselage tapering gently towards the tail which carried biplane tailplanes with balanced elevators. There were four slender finless rudders, roughly equally spaced between these two planes. The undercarriage was a simple fixed split axle arrangement, plus sprung tail skid. The Vellore I, fitted with a 515 hp (384 kW) Bristol Jupiter IX, flew for the first time on 17 May 1928. It appeared at the RAF Hendon display in June that year, then went on to RAF Martlesham Heath for tests in October. These it passed with flying colours, its performance better than predicted and with perfect reliability. In early 1929 the Vellore was fitted with an Armstrong Siddeley Jaguar VI and extra tankage in the freight compartment for a flight to Australia. Leaving Lympne on 18 March 1929 with a full 5,000 lb (2,270 kg) load including the extra fuel, the Vellore II (or Jaguar-Vellore) made Benghazi in stages before a misbehaving engine brought on a forced landing. After spares were sent out the flight continued until, over the Timor Sea and close to Australia, the engine began to malfunction again and the Vellore was wrecked in trees near the Cape Don lighthouse at the western extremity of the Cobourg Peninsula on the Australian mainland. Happily the two Australian crew were unhurt. The Vellore I and II were the single-engined examples of the marque. The Vellore III was a twin engined development intended to carry greater payloads. The engines, a pair of 525 hp (390 kW) Jupiter XIFs were mounted in nacelles with NACA cowlings midway between the wings, their struts replacing the inner interplane struts of the earlier variants. The lower wing was slightly decreased in span so the outboard interplane struts now leaned outwards. The other alteration was to the main undercarriage, now mounted immediately below the engines and thus wide track for a landplane. The Vellor III could also be operated as a seaplane with single-step floats replacing the wheels. A second twin engined Vellore was built, differing only in having slightly higher compression Jupiter IX engines and eventually known as the Vellore IV. This aircraft was in use until early 1935, transporting troops and stores between Martlesham and nearby Orfordness. The last aircraft of the series was based on a partially completed third twin engined Vellore airframe, fitted with a new, broader fuselage with a glazed pilots' compartment, a spatted tail wheel and powered by 600 hp (450 kW) Bristol Pegasus IM3 radials. 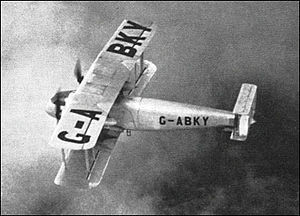 This variant was renamed the Vickers Vellox, flying for the first time on 23 January 1934 in the hands of Mutt Summers. Vickers hoped to sell the Vellox as a ten passenger airliner and the new fuselage had five windows a side in front of large starboard side freight doors at the wing trailing edge, but the sole example was used by Imperial Airways as a freighter, mailplane, and for testing Lorenz blind landing equipment. 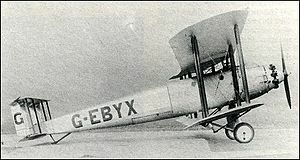 The Vellox crashed shortly after take off from Croydon Airport in August 1936 due to an loss of power possibly as a result of some fuel problem. The crew of two pilots and two wireless operators were killed. Jupiter powered single-engined freighter, one built. twin engined land or seaplane with Jupiter XIF engines, one built. Second Vellore III completed as a mailplane with two Jupiter XIF engines, one built. twin engined Vellore with new passenger fuselage and Pegasus engines, one built. Andrews, CF; Morgan, E.B. (1988). Vickers Aircraft since 1908 (2nd ed.). London: Putnam. ISBN 0-85177-815-1. "The Vickers "Vellore"". Flight. 6 September 1928. http://www.flightglobal.com/pdfarchive/view/1928/1928%20-%200824.html.